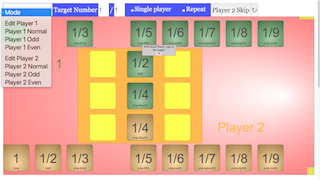 The target number can be a whole number or a fraction, depending on the user's choice. Player 1 will begin first by dragging the green cards to the respective cell. Note that if Player 2 attempts to place their cards during Player 1's Turn, a pop up will occur. 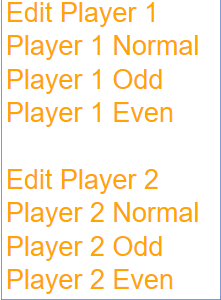 Note that if Player 1 tries to add a card during Player 2's Turn, a similar pop up will occur. Allows you to play alone! Allows you to repeatedly use the same cards. Note that the cells will turn white to show repeat mode being toggled on. Skips the current player's turn for various reasons. Toggling this will enable to alter each player's decks.